Oca, an edible root is also known as New Zealand yam. It is cultivated in some parts of India as well. Oca is one of the common root vegetables used in India after potato and is famous for its rich texture and nutrient-dense properties. Oca is rich in vitamin C (66% of daily value) helps in fighting infections and stabilizing immunity. It is also rich in iron (up to 70% of the daily value) and hence helps in improving hemoglobin levels. It can be consumed by pregnant and lactating woman. Oca is very low in calories, about 30 Kcal/100 g, making it a healthy weight loss food as well. 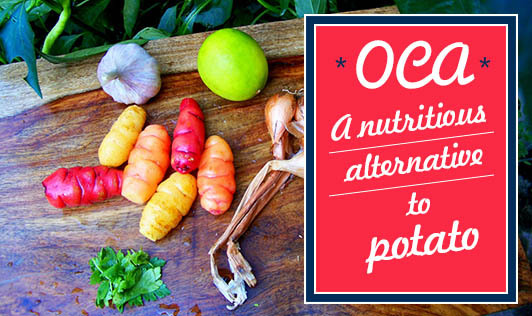 Oca is a good replacement for potatoes. It can be steamed, stir-fried, or baked. Moreover, it is a richer nutrient source as it contains oxalic acid; hence the scientific name Oxalis tuberosa which helps in binding calcium and improving bone health.